For fucks sake, enough cat pictures, they’re not funny. I guess you missed the announcement that the last day of the month was a theme day, today beings cats. You might want to get over it. You’ll feel better, i swear. 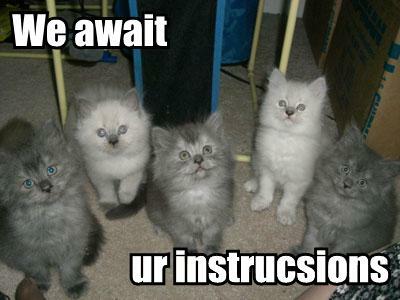 Who can feel bad when there’s an army of fuzzballs ready and waiting?? Win, I say. For some people you just have to be in the right mood. Yesterday I thought this was annoying (although I knew it was coming). Today I’m chuckling at some of them. I guess I got enough sleep. Although Hepathos kept putting things on my head.